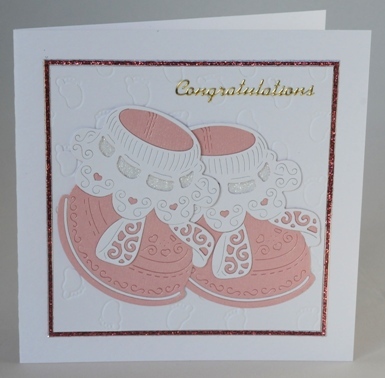 This card features a pair of bootees which I have die cut from pink textured card and embellished with white card. The bootees have some highlighting with white glitter which will not shed. The bootees are set on a white background which I have embossed with baby footprints and this is framed with pink glittery borders. The word congratulations is written in gold lettering at the top of the card which is blank inside for your own message of welcome. If ordering by phone, please reference card #692.